We are determined to always give our customers the highest level of quality and value in the parts we manufacture. We strive, not to just meet, but exceed our customer’s needs. This is done, by producing a product that is of the highest quality, without adding additional costs to our customers. With our customers in mind, we constantly evaluate our processes for cost savings and efficiencies. Dial Tool Industries is committed to quality. We take an enormous pride in maintaining our internal quality requirements, In addition to the customers’ stated print tolerances/specifications. 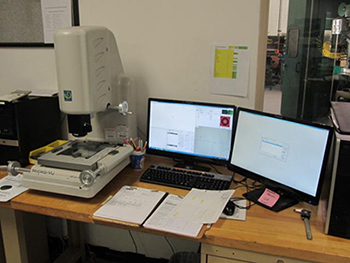 To achieve this, we use a variety of metrology such as micrometers, gauge pins, calipers, optical comparators, height gauge, visual systems, and gauge blocks. To guarantee quality is achieved on every part that we produce, we monitor the following areas of the production process at all times. Constant monitoring of the parts running in the production area after set up approval. Last piece inspection before moving to next operation. 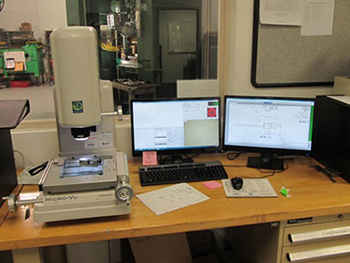 Keeping records and samples of each run to ensure consistent flow of quality parts to our customers. Work with customers to keep prints up to date with changes that occur over time.